Home Blog 24 Hours to Get a FREE Hoo! 24 Hours to Get a FREE Hoo! We are just getting rolling with our Hoo-rag Micro Performance Shirts and so far our anglers are loving them. 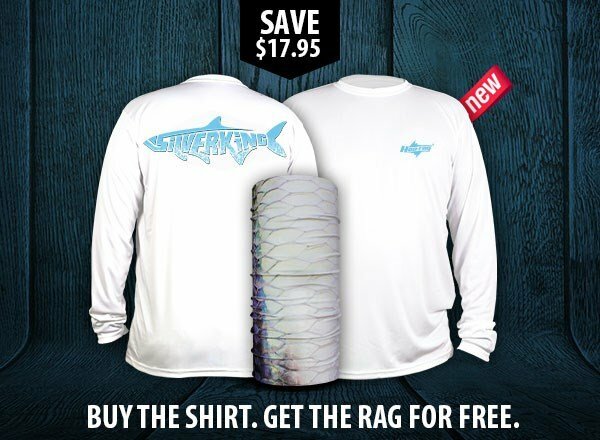 Featuring UPF protection of up to 50, these shirts are perfect for long days on the boat, paddle board or roaming your local waters looking for your favorite species. This product release was heavily influenced by customer feedback so we are very excited to get you guys rockin’ these rad new shirts! Each order of a new micro performance shirt over the next 24 hours will automatically include a complimentary Hoo-rag! No need to include a promo code or add the rag to your cart. This promotion is good thru 9/30/15 at 2pm EST so act now! Click here to check out all 8 designs or keep scrollin’ to them in all their glory! The Large Mouth Bass. A pig of a fish and more than willing to slurp a soft plastic on the bottom or smash your favorite plug on the surface at first light. It’s the most sought after fish on the planet and we prefer to yell “LUNKER” when we strike one over 8 pounds. We took the bass’ nickname and tricked out the words on our Lunker Performance Shirt to look just like that fat little fish you love to hammer! Will include the Lunker Junkie Hoo-rag. The Mahi. A fast growing, pelagic fish with an appetite for destruction. And let’s not forget it’s absolutely delicious! We took this saltwater beauty’s unforgettable shape and spelled it out with a typography that looks mean, lean and green on our new Mahi Performance Shirt. Will include the Bull Hoo. The Red Drum. We call them the “Men in Copper Jackets” but you can call them whatever you want. Red fishing is for anglers who love a visual experience while on the water. There is nothing better than watching a giant drum turn on and eat your offering and listening to the drag scream across inches of water on your favorite flat. We took this beauty’s name, played with the letters and came up with this rock ‘n’ roll inspired Red Drum Performance Shirt that will surely turn some heads! Will include the Redfish Riot. Megalops. Easily the most pissed off fish on the planet. These silver fish carry attitudes bigger than their scales and are appropriately known as the ‘Silver King’. In our humble opinion, the tarpon is the most frustrating, rewarding and fist-pumping fish in the world. We took our favorite nickname and tried to make it as rad as humanly possible on the new Silver King Performance Shirt. Will include the Tarpon Real Foto Hoo-rag. The Super Snook Performance Shirt features the an original artwork from Joe Seroviec. Everyone loves the tenacity, strength and aggressive nature of a linesider and this piece of awesome art is one of our favorites! Will include the Gray Digital Camo Hoo-rag. The Schooled Performance Shirt is all about that bait. While throwing artificial bait is rewarding and fun, there is nothing like finding your favorite school of bait and seeking out the giants that lurk below. Will include The Schooled Hoo. The Native Fly Performance Shirt features the Florida State flag with our own little twist for all you long rod enthusiasts that love to strike your favorite species on the fly. Will include The Florida Flag Hoo-rag. Each shirt provides a UPF rating of up to 50 and is printed in our production facility in Fort Pierce, Florida. These performance shirts are ready to keep you protected from the Sun’s harmful rays while you are out doing the things you love! And you’ll be covered in Hoo sun protection with your Free Hoo with any shirt purchase – valid thru 9/30 at 2pm EST.